The city's first truly public library is almost intimidatingly elegant - but it's a mark of the space's design and management that all are made to feel welcome. Inside, the Library boasts a gorgeous reading room that would make anyone feel like royalty - indeed, it rivals the ballrooms of European palaces. But out in front, along the street, is where this illustrious institution truly connects with the city around it. A series of well-linked spaces - steps, plazas, little nooks and pathways - provide innumerable places for sitting, meeting, eating and chatting. 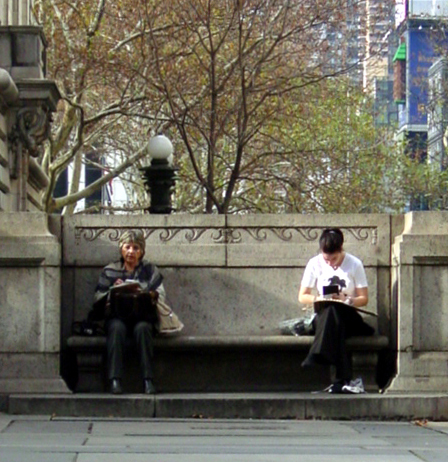 Overall, these places act as a capacious "front porch" complementing the library's "back yard" - which is, of course, the famed Bryant Park. The subway doesn't open directly into the library, but it's well integrated. A wide bank of shallow steps along Fifth Avenue welcomes people up to the main entrance and a large "front porch" area that spans the width of the building; there's also a well-marked door on 42nd Street. Pathways lead from the front and sides of the building around to the lovely Bryant Park in back, and also provide handicapped access. This sumptuous building seems to equate intellectual riches with luxury, with loads of marble, brass, carved wood inside; stately paths and steps and benches outside. There are also plenty of tables and chairs outside (and one need not purchase food to use them). The lions flanking the main steps have become city icons and are decorated for holidays and special events. Lush landscaped areas adjacent to the sidewalk provide a bit of a buffer and also some welcome greenery in a district where concrete and asphalt dominate. 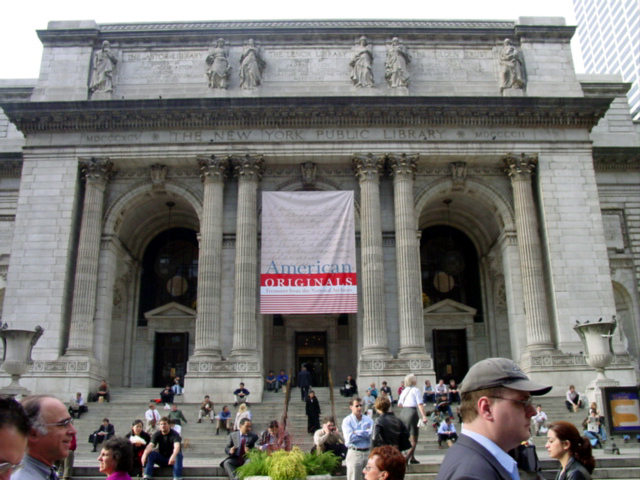 In addition to books and all other forms of information, the library organizes and hosts an array of exhibits. Outside, two large food kiosks draw substantial crowds even in chilly weather. 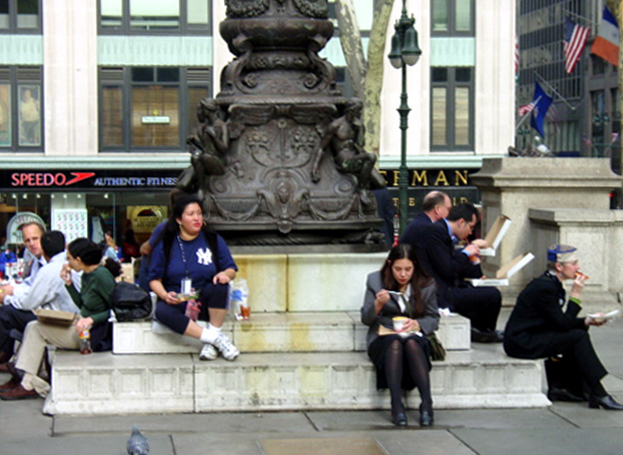 And of course there are the steps, a favorite spot for meeting and for people-watching. 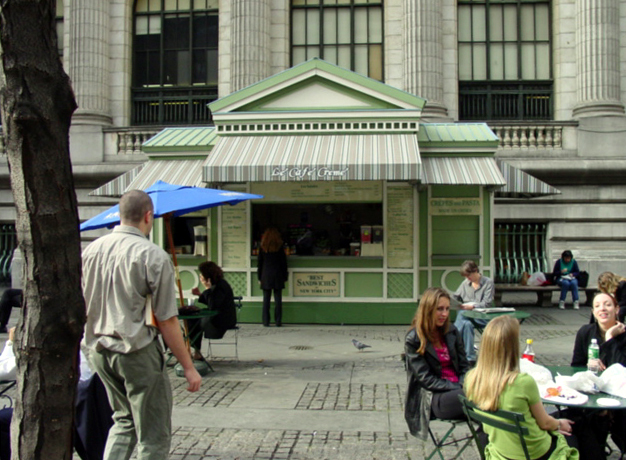 Thanks to the food kiosks and generous outdoor spaces, this place seems to draw as many eaters and people-watchers as readers and researchers. Although few people seem to know each other (this is midtown Manhattan, after all), there is a palpable sense of good will and well-being that comes from the welcoming surroundings. Even loners and loiterers seem becalmed. 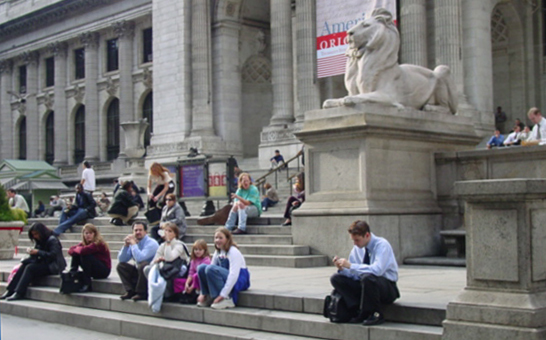 The New York Public Library emerged in 1895 from a historic agreement, when the $2.4 million fortune of Samuel J. Tilden, left to establish a free public library, was merged with the existing, semi-private, yet financially troubled Lenox and Astor libraries. $9 million dollars and 16 years later (to the day), the glorious Beaux-Arts edifice designed by Carre and Hastings, then little-known architects, opened to the public. Sited on the former Croton Reservoir, the Library, which now serves as a research branch for the Humanities and Social Sciences, boasted 75 miles of shelves and a million books. Benches are integrated into the architecture. Seating is built in everywhere - even at the base of the flagpole. 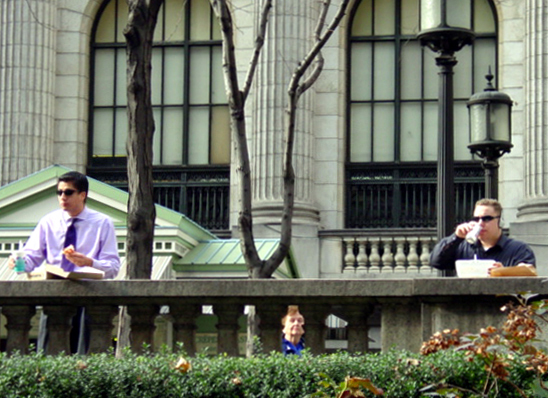 Wide railings serve as a lunch counter with a view of the street. 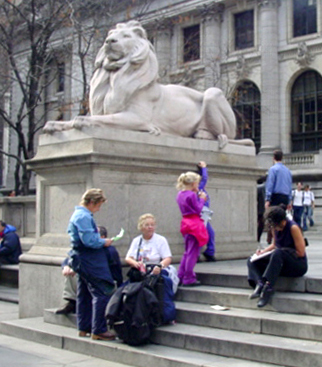 The library's famous lions are a popular meeting spot. One of two kiosks serving food - a real draw.